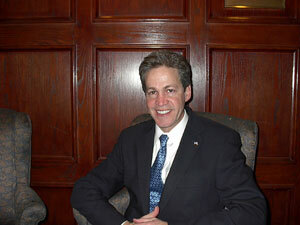 Sen.-elect Norm Coleman takes a break at the National Press Club in Washington. Republican Sen.-elect Norm Coleman met in Washington on Wednesday with congressional Republicans to look ahead to strategy for the next session of Congress. For the first time in more than five decades Republicans will control the House, the Senate and the White House. The meeting came hours before a Washington memorial service for the late Sen. Paul Wellstone. Washington, DC — Coleman says congressional Republicans are fired up following GOP advances in last week's elections. But Coleman also says many senators in his incoming freshman class ran on the same "get it done" theme he did. And Coleman says even with the majority, Republicans realize they'll have to reach across the aisle to pass legislation. "Even in these closed sessons, the talk is about getting things done and about service; certainly in this instance there being some celebration being back in the majority with an understanding that we now have responsibility to produce and get stuff done. No excuses. And people are ready to accept that responsibility," Coleman said. Coleman has been spending a considerable amount of time with interim Sen. Dean Barkley, I-Minn., who was appointed last week to fill former Sen. Wellstone's term. Coleman says it remains unclear exactly when he'll take the reigns from Barkley, but that he expects a smooth transition. Meanwhile, hundreds of people ranging from national political leaders to local maintenance workers will gather Wednesday night in Washington to honor the life of Paul Wellstone. The memorial for the late senator is being held at Washington Hebrew Congregation. The evening will include music, eulogies, passages from Paul and Sheila Wellstone's speeches, and prayers.